Kask Mojito X review - LA VELOCITA. The original Kask Mojito was a handsome, low-profiled lid at a time when everything was pointy, angular, and mushroomy. I almost bought one back in 2014 but changed tack at the last minute and went with a Specialized Propero II because it was $50 cheaper and I was poor at the time. I was always a little bummed out when I saw Mojitos on the road, which happened a lot because that was a damn popular helmet. Fast forward to 2018 and the Mojito is back with updates and an X added to its name. Australian RRP is $239.00 for gloss colours and $265.00 for matte, which is a little above typical mid-range price of $200. So how does the Mojito X sit in the 2018 helmet market? The Mojito X is very light for a helmet at any price, not just mid-range. I grabbed all the helmets in my house to compare and keep in mind that the Mojito X is the only helmet that hasn’t been used in a Grand Tour. Bear in mind international readers that these are Australian helmets made to AUS/NZ standards which are always slightly heavier than the rest of the world. It’s impressive to see the Mojito X hitting the same weight numbers, or lighter, as much more expensive helmets. 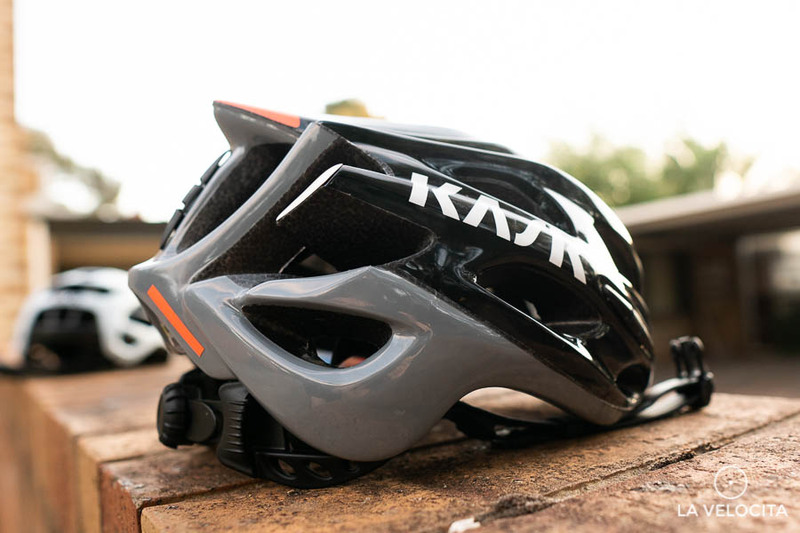 Kask’s helmets tend to use heavier straps and cradles than their competition so they feel even lighter when worn thanks to a slightly lower weight distribution. Other noteworthy features are the reflective dots on the rear, the plush eco-leather strap, and the easily adjusted retention system. It’s also so ridiculously glossy I found it hard to photograph. Kask helmets have always suited my ovalized noggin very well. I have a decent sized bump at the back of my head and Kask’s retention system can be dropped low to sit underneath it. On the retention system; it’s a more basic version of what appears in the high-end Kask models. It slides freely up and down the two rear straps rather than using a plastic slider like the Valegro and Protone. It lets the cradle easily drop into the most comfortable spot and you then rotate the dial to lock it into place. The soft straps run around the ears and into Kask’s supple eco-leather chin strap that feels might nice under your chin. The Mojito X is a very comfy lid. There’s a small pressure point on the back of my head where the rear straps exit the shell. They emerge straight out of the shell and thus don’t sit exactly flat against the shell like the plastic sliders in other cradles. I could occasionally notice it on the back of my head when riding. It wasn’t uncomfortable, just an unusual point of contact I wasn’t used to. Most of the Mojito X’s inside is covered with a single piece of foam that runs along the top and down to the front where it spreads laterally. That foam shape gives a large contact patch that reduces pressure exceptionally well, much better than the Valegro’s ultra-low profile padding that runs front to back. There’s no pressure points or dents left in your forehead with such large and soft padding. Once on, the Mojito X sits exceptionally low and close around the head. It makes other helmets look bulbous. There’s very little forehead and side overhang. The Mojito X has that wonderful “barely there” feeling that comes with low-profile and lightweight helmets. The forehead pads are much thicker than most lightweight helmets, enhancing the comfort and admirably absorbing a lot of sweat. It sits low and tight to the head with no movement or flopping around. I switched back to my beloved Protone after months with the Valegro then the Mojito X and boy does it feel heavy by comparison. All the straps stay completely still regardless of high speeds and strong winds. All of my Mojito X testing was done during a variable Spring that vacillated between cold and wet, and toasty high-twenties and low thirties. Ventilation and airflow is quite good thanks to the number of vents and the large exits on the rear that let the air flow through. Frontal ventilation is decent but lags behind some of its mid-range peers like the Specialized Propero that maximise air directly onto your forehead. In the Kask range, ventilation is better than the aero Protone but inferior to the outstandingly airy Valegro. The POC Octal still sits atop my list of most breathable helmets. Ventilation is good, but the frontal vent layout isn’t quite up to the top performers. Aerodynamics aren’t a priority with the Mojito X so it won’t give you any gains there. I will say that the low profile shape stops it from catching wind gusts; something I appreciate. Even very-high end helmets can be quite vulnerable to strong winds (POC Octal and Specialized Prevail II for example) so it’s nice to have a stable helmet. Like all Kasks I’ve used, the Mojito X doesn’t get along well with sunglasses. The retention system drops down very close to your ears and that interferes with arms of sunglasses. Sunnies with very flat bladed arms can slot under the retention system nicely. My main pair are Koo’s Open Cubes that work fine, and occasionally I wear some POC Do Blade Opens that are similarly slim. Glasses that hook behind your ears or have chunky arms can clash with the helmet and cause some mid-ride wrestling. Glasses choice gets more important because the Mojito X lacks sunglasses-friendly vents for storage. I’ve come to rely on the Valegro’s handy sunglasses storage. It’s doubly important for my Koo Open Cubes that have pivoting instead of folding arms. They store nicely in the Valegro’s vents, but one wet ride in the Mojito X left me with nowhere to stash them. Those accustomed to slotting their glasses in their helmet will need to find alternate options when wearing a Mojito X. My main criticism of the Mojito X is how it eschews some key features expected of helmets in this price bracket. There’s no MIPS, no aero optimisation, (as stated above) no sunglasses storage, and a very simple retention system. Recent years have seen a helmet arms race where brands are stuffing more and more into lower priced lids. The Mojito X’s spec sheet doesn’t look quite as good as some big-name competition. The Mojito X occupies the same market segment as the original Mojito. It’s a damn good helmet that sits above the mean price of mid-range helmets. Kask have nailed the comfort, made airflow quite good, and kept the low profile good looks of the original Mojito. It’s a good performer on the scales too. I always recommend people try helmets on before they buy and be sure to take your sunglasses to check compatibility too. It doesn’t spoil you with features and mod-cons but it does spoil you with being a very nice helmet to ride in. Disclosure statement: This helmet was sent for review by Kask Australia.